Vampires are very 'in' at the moment. But I see the vampire genre in the same sorta light as how it was during the Great Depression when every second movie had a song and dance in it to 'cheer people up'. Now it seems that a lot of movies have to use supernatural creatures to keep the interest factor going on. 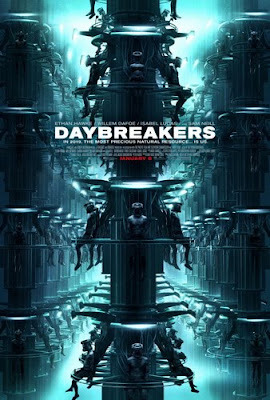 Daybreakers, is of course, about vampires. But instead of taking the easy road of a human/vampire love affair, this shows us an entirely new world: a world run by vampires. The year is 2019, and almost the entire human race has been wiped out as most of them have become vampires. But because most of the world are vampires, there is a shortage of humans which means a shortage of blood. So what do they do when there isn't a single drop left? Edward Dalton (Ethan Hawke), a vampire, teams up with a group of humans to try and solve this issue. The movie has a fantastic concept which has come at the right time...it's an actual vampire 'horror' as opposed to a vampire romance. However, this film is a little short on it's delivery, which is a shame, because it could have been so much. I really did enjoy it, and revelled in it's originality and thought put into how the world would be if it were run by vampires. The biggest problem I had was the fact that the effects were very I Am Legend. I am not really a huge fan of that film and see it as one of the worst CGI failures I have ever seen. The film too often allows itself to go down the same road as I Am Legend, and wastes it's great premise on shock value and harsh truths that the world may change one day as we know it. Also, Ethan Hawke seemed a little withdrawn from his role. Hey, I know he is a vampire and he's supposed to be dead and all, but he didn't bring any life to his role at all. This is a great film to come out of Australia filled with a fantastic veteran cast that includes Sam Neill and Willem Dafoe. It is wildly entertaining, but unfortunately let me down emotionally and effectively. An original horror, but doesn't quite live up to it's premise.